Many brides dream of being a “princess for the day” on their wedding day, and why not? It’s the one day you get to be the star of the production! One way to ensure that you enjoy the spotlight is by knowing you have chosen the perfect bridal bouquet. A beautiful bouquet that complements your dress and hairstyle is one of the best ways to create a stunning look for your special day. Looking to the royals is one way to make an inspired and confident choice in your bouquet; they have, after all, stylists plus years of tradition and culture to inform their choice! BunchesDirect has taken some of the most beautiful Royal bridal bouquets and matched them with suggestions you can buy yourself, to help you get the look, for less. Enjoy! For her fairytale day, Princess Marie chose a traditional bouquet of white roses paired with accents such as myrtle and winter barley, which have been used in Danish wedding bouquets for centuries. If you love this look, try Sweet Bliss by BunchesDirect. Princess Mary selected a beautiful bouquet featuring roses and Australian eucalyptus specially flown in to pay tribute to her Aussie heritage. Choose a pre-made wedding bouquet and feel free to add your own special touches to personalize it. If you love this look, try Together We Stand by BunchesDirect. Crown Princess Victoria chose a very elaborate (and expensive) bouquet featuring lush blooms like orchids, lily of the valley, roses, gardenias, and peonies. If you love the look and exotic beauty of orchids, try Near the Sea, by BunchesDirect. Princess Claire selected a very sweet and delicate bouquet of white freesia for her special day. If you love this delicate elegance, try Simple Glimmer by BunchesDirect. Be sure to check the full BunchesDirect website for even more “royal” choices! This month we are pleased to offer you another guest post from our Canadian partner, Best for Bride. Please enjoy, and if you are in the Toronto area, be sure to visit one of the four Best of Bride locations and receive a free BunchesDirect.ca $50 gift card with your dress purchase! Flowers have always inspired weddings, finding their way into everything from décor and dresses to bridal jewelry and accessories. Just like they spruce up the ambiance of a wedding with their romantic touch, these beauties can also enhance the femininity of a bride on her special day. In fact, there is nothing like fresh blooms to add extra charm to the bridal look. Best for Bride, the bridal fashion expert from Canada, suggests the following interesting ways to accessorize your wedding outfit with flowers. Check it out! The bridal bouquet is a wedding staple; one that is an essential part of the bridal ensemble. Bouquets come in different colors, shapes and styles, so there are enough choices for both traditional and modern brides to choose from. Your bouquet should reflect the wedding theme and should neither be too big nor too small for your frame. If your bridesmaids will be carrying bouquets, your bouquet and theirs should have a cohesive look. Flower crowns are beautiful hair accessories that look good on almost any bride. While bigger blooms and thicker crowns have a rustic and casual appeal, delicate floral crowns with pretty little flowers are elegant and whimsical. Floral crowns can be fashioned in different styles, and can be placed in a variety of ways. Popular choices include half and full-flower crowns that are either wrapped around the head or angled to one side. You can create your crown with flowers from your décor, and it will integrate your look with the overall theme. Nevertheless, always try to choose flowers that will stay fresh for longer, so it doesn’t wilt and ruin your fresh look. Read more about making floral crowns. Whether you choose to tuck a single flower into your up-do, or weave a scattering of tiny blooms into your hair, fresh flowers are wonderful accessories for your hair. Floral accents that are woven into the hair and look like they belong there are refreshing and unique. Almost any flower can be used for this purpose, and thick textured flowers are particularly easy to incorporate into any hairstyle. They look perfect on summer and Boho brides. Take a look at this article on Brides for some fabulous inspiration on adding flowers to your bridal hairstyle. Wrist corsages are a popular bridesmaid accessory. However, they can also be used by the bride who wants more flower power in her wedding day look. A bunch of beautiful flowers around your wrist will add an exotic touch to your ensemble. Also, since your hands will be photographed a lot, this is a great way to make it look unique. When designing a flower bracelet, check with your florist to pick flowers of the right size that match the dimensions of your arms. Mix-and-match floral bracelets are just as popular as those with a single focal flower and dainty ones around it. A floral waistband would be a perfect accessory for a bride at a garden wedding. Flowers can be woven on to a sash or belt, and tied in the center or to one side of your dress. This is an easy and effective way to draw attention to your tiny, slender waist. Just as with choosing flowers for your flower crown, you have to consider how sturdy the flowers are when adding them to your waistband. Flowers that wilt easily or can’t stand the strain of too much movement can ruin the overall effect. Discuss this factor with your florist, and she can help you choose the best combination of blooms to avoid this. When the hemline of your wedding dress barely skims your ankles, or your wedding dress has a slit that exposes your feet, a flower anklet is perfect to dress up your dainty feet and add a touch of color. They are incredibly romantic and a wonderful foot accessory for beach brides, who have many constraints when choosing footwear. It will also work well for garden and Boho wedding themes, as long as the wedding dress isn’t too long to block it from view. Whether you choose to keep it light and small or rich in color and texture, a flower anklet will add signature style to your bridal look. For some irresistible, gorgeous floral anklet designs, take a look at this page on the Flyaway bride blog.You can also order a beautiful fresh corsage from BunchesDirect.ca and wear it on your ankle! 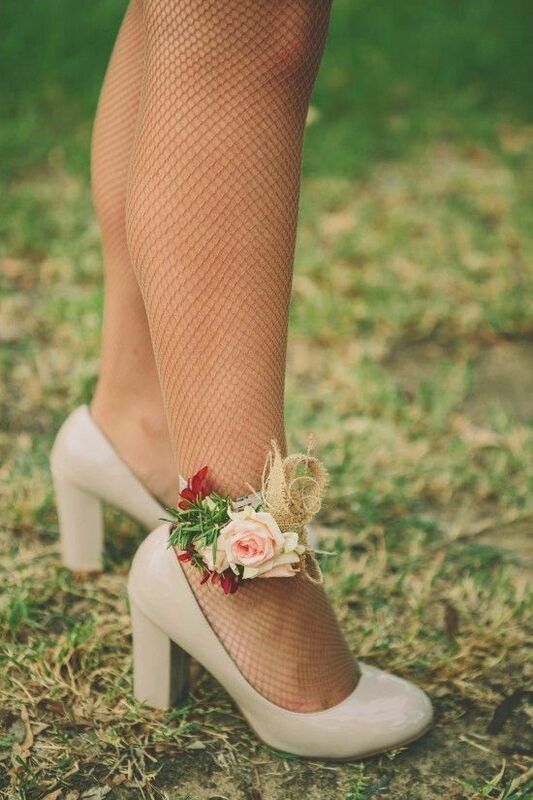 You can add an interesting twist to the traditional wedding garter by fashioning it out of flowers. This will be a fantastic change to the typical lace and satin garter. Trust your florist to do this for you with the flowers that you love. Either have the flowers added to an elasticated band that you pull onto your leg, or have it stitched into a ribbon that can be tied around your leg so it fits just right. If you love flowers, add even more of them to your wedding day look! A 3-D floral wedding dress provides even more blooms for you to enjoy. This huge trend features wedding dresses with remarkable floral motifs and accents that pop out and look real. The 3-D effect results from the mixing of different fabric textures like lace and net, over satin or chiffon for a pronounced effect. We are all eagerly anticipating some very big celebrity weddings due in 2016! 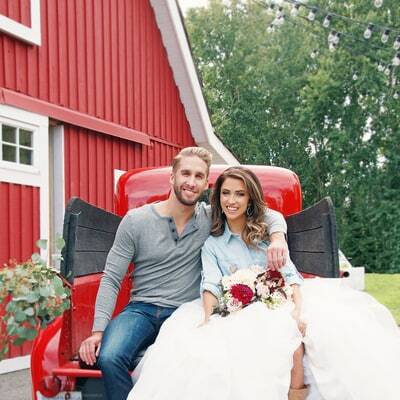 We decided to check in on the wedding planning and the latest details for the upcoming nuptials of some of our favorite celebrities. Maybe you will be inspired with ideas for your own wedding or special celebration! Anticipation is half the fun, but we can’t wait to see the real events! Enjoy. The pair were spotted wearing matching rings recently, leading some to speculate that the duo were already hitched. There has been no wedding yet, however, and they are being careful not to let dates or deets slip out. Taylor has just revealed that his must-have at the reception (apart from his bride!) is good food, namely, pizza! 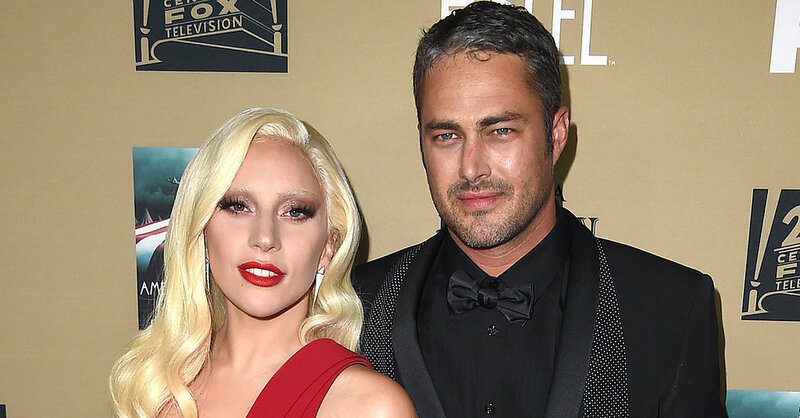 Lady Gaga has revealed that whatever dress she picks will be totally with her groom in mind, and that she wants a “real” wedding vs. any talk of elopements. She wants to keep things low-key, however, as opposed to a big splashy affair. Eva got engaged to Jose last December in Dubai. She has related that elaborate and huge wedding plans are not as much a priority to her this time around as for her first marriage to NBA star Tony Parker, though recent sources state that she is now expecting to invite many of Hollywood’s “who’s who.” There are also rumors circulating that they may be getting hitched in the next few weeks, in Mexico. They look forward to including family and friends in an intimate celebration, and maybe at a beach wedding. Rumors are circulating that Eva’s pal Victoria Beckham may be designing the dress. The latest updates are that this celebrity couple are in fact planning two weddings, one in the US and one in Australia. As of mid May, Miley reportedly announced that she wants a carnival themed wedding, with drugs available for her guests (let’s hope she was joking about the last part). Audrina and Corey got engaged last November. The couple since revealed that they are expecting their first child together, making their wedding plans all the sweeter. Pregnant and very beautiful Audrina recently went wedding dress shopping with US Magazine, making us believe that their union will happen later this year. In her blog, Audrina reveals that being pregnant as well as planning a wedding is a lot to cope with. She also confirmed that their wedding will take place after the baby is born, saying, “I have a feeling our wedding photos will be extra adorable with our little baby in our arms instead of in my tummy!” We think a beautiful and elegant Lavender Bliss bouquet would suit Audrina perfectly. What do you think?